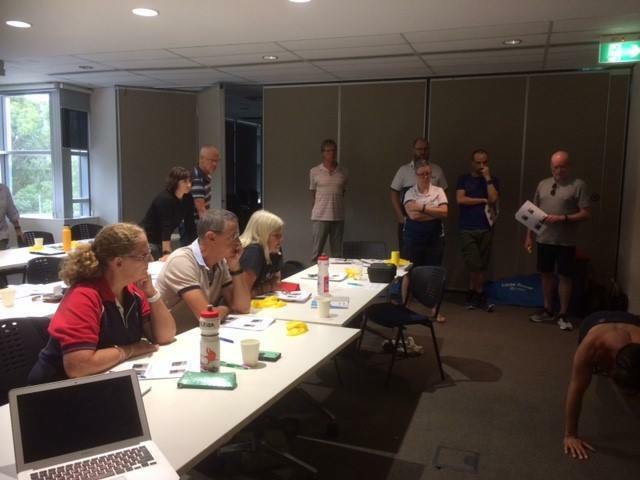 The Masters Swimming NSW Coaching Team hosted an exceptional workshop with physiotherapist, Jerry Murphy at the Sydney Olympic Park Sports House on Sunday, 13th January 2019. Jerry presented to swimmers and coaches on common problems with ‘swimmers shoulder’ including awareness, prevention and recovery. One of the main issues facing older swimmers is dealing with shoulder injuries. The aim of the workshop was to advance understanding of shoulder injuries by coaches, means to prevent swimmers injuring their shoulders and assist the treatment of swimmers once they have experienced shoulder issues. Jerry described the various types of shoulder injuries experienced by swimmers and discussed the approaches used to treat these injuries. Peter McGee of Wett Ones Masters Swimming Club found the workshop by Jerry extremely helpful. Jerry stated his goals as a coach were to achieve three things from the workshop: (1) a better understanding of the diversity of shoulder issues faced by swimmers. (2) the broad approaches used to treat shoulder injuries and (3) ways coaches can ameliorate the issue of swimmers shoulder. Stay tuned for the next workshop focusing on ‘The Aging Swimmer’ by Peter Raeburn scheduled for 13th July, 2019. This workshop will cover questions including; What happens to the body as we age. What specific approaches reduce the effects of aging on our performance and what can the coach do to ensure swimmers have a better chance of reaching their goals.